SARAH HELP ME…HELP ME SARAH!…or HELP ME MACS IT’S RUNNING..
A quick and easy way to create a fake tongue for all your fx projects. Including epic fail and hilarious acrobatics when Elli is messing around. Nikon D810, Carl Zeiss 85mm f/1.4 Otus, Nikon 24mm f/2.8 Ai-s, Nikon 105mm f/2.8 MICRO Ai-s, iPhone 5S, Final Cut Pro X, Apple Macbook Pro 15″ Retina. Easy to understand tutorial, i might use this as a base. I'm looking especially for an effect where the tongue have been branded with a hot iron. (Think Caim in Drakengard) Could you give me any advice to make a wearable prosthetic in this fashion? Thanks. Does Ellie and macs date? Can someone answer me please! Did you guys put your molds in the freezer or in the refrigerator? That could be great, l will make D#$@ rip off with.. worst and disturbing, might be remove and get a banned for showing fake D#$@..
"I'm not afraid to get sticky"
Mykie is amazing but Elli, you're better for the reason you do techniques I had never heard of or seen. you show that you can create the same things with multiple different tools and mediums. Love you! she likes Chinese food theres hope ! Agar agar is the vegan version of gelatin, other than that im not sure of anything thats vegan and mouth safe. OMFG I lol'd when Ellie said or... maybe cow tongue. I hate when people come and say "no offense, but ____'s tutorial was better" like wtf is your point in coming to someone else's video and saying that? I noticed the same thing!!! Did you have to let the clay sit for a day before filling it or did you use it the same day? Thanks!!! how long do you leave it in the freezer for? love your videos!!!! Would you recommend using Polymer clay when making a mold for the tounge? +BeccaCobernMusic Might be hard to get it to stick, but try! It's all just a matter of opinion. I watch them both! 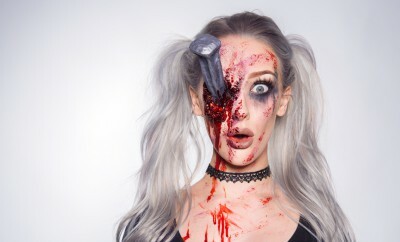 I love this but I think you guys should've credited Mykie..
+ellimacs sfx makeup well, I'm sorry for the accusation, Hun. Hope there is no hard feelings and yeah, I know what you mean. I apologise deeply. Why don't we ever see Macs? vart köper man latex ??? och vart köper man fake blod osv??? +Emil Qwarfordt Latext köper vi oftast på Panduro men det finns på Buttericks och Slöjddetaljer också. +jessica thompson Not with Gelatin!! It would tear while you're using it. Try rubber. What brand of liquid latex do you use? +Collin Hancock Don't think the brand matters really. There are so many out there. I've used threee different brands with the exact same result. I use a local brand from a store here in my town. I love the background :) So creative! The hardest thing about this video is watching thes Beautiful girls turn in disfigured creatures or monsters.......KEEP UP THE AWESOME VIDEOS!!!!! Elli were are you from? +Мельник Елизавета Sweden :) You? Could you create a Uruk Hai makeup for men ?